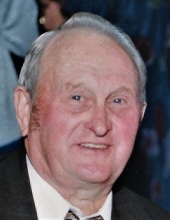 Celebrating the life of Robert H. Kalies Jr.
Obituary for Robert H. Kalies Jr.
Robert H. “Bob” Kalies Jr., age 91, of the Town of Plymouth, passed away Thursday afternoon (November 22, 2018) at Aurora Sheboygan Memorial Medical Center. He was born on September 23, 1927 in Plymouth, son of the late Robert Sr. and Mary (Bidlingmaier) Kalies. Bob attended St. John Lutheran Grade School in Plymouth. He served in the United States Army as a surgical technician during World War II. He was honorably discharged in 1947. On April 7, 1951, he married Margaret Fleisner at St. John the Baptist Catholic Church in Plymouth. The couple has resided in the Town of Plymouth since the marriage. Marge preceded him in death on February 26, 2016. In addition to farming, he enjoyed: bowling, horseshoes, gambling, making Christmas candy with Marge, playing cards (especially sheepshead), and spending time with his grandchildren. Survivors include: Children: Kathleen (Jack) Prettie of the Town of Plymouth, Robert (Mary Lou) Kalies of the Town of Plymouth, Monica (Larry) Krieski of Town of Sheboygan Falls, Richard (Marie) Kalies of Plymouth, WI, Virginia Bowen of Greendale, WI, and Nancy (Todd) Guse of Town of Plymouth; Thirteen grandchildren; Jeffrey Prettie, Nicholas Kalies (Friend: Cristina Raish), Christine (Mike) DeBruine, Andrea (Daniel) Trott, Shane Krieski, Jason (Laura) Kalies, Sara Kalies (fiancé: Dr. James Morgan), Michael Bowen (Fiancée Jessica Belcher) , Margaret “Maggie” Bowen, Nathaniel (Colie) Guse, Matthew (Samantha) Guse and Nicole Guse; and Five great-grandchildren: Taylor, Evalyn, Lena, Breckyn, and Aria. He is also survived by other relatives and many friends. Bob was preceded in death by: His parents; Wife; Granddaughter: Patricia Prettie; three brothers-in-law: Norbert, Gregory and Roland Fleisner; four sisters-in-law: Dorothy Zimmerman, Genevieve Ehlenbeck, Irene Hoefler and Isabel Schultz; and many aunts, uncles, and cousins. Funeral Services will be held on Friday (November 30, 2018) at 11:00 A.M. at Suchon Funeral Home in Plymouth. Father Wayne Bittner will officiate. Burial will be in Plymouth Woodlawn Cemetery. Visitation will take place on Friday (Nov. 30) at Suchon Funeral Home from 9:00 A.M. until time of services. To send flowers or a remembrance gift to the family of Robert H. Kalies Jr., please visit our Tribute Store. "Email Address" would like to share the life celebration of Robert H. Kalies Jr.. Click on the "link" to go to share a favorite memory or leave a condolence message for the family.